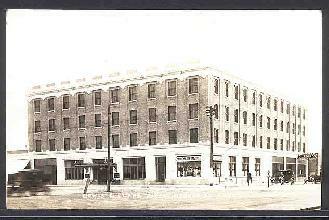 In September 1915 then ND Governor Louis Benjamin Hanna, a successful businessman from the Red River Valley with interests in lumber, grain and banking, acquired the InterOcean Hotel and renamed it the Lewis and Clark Hotel. In 1917, the original structure was demolished and replaced with the new Lewis and Clark Hotel at a cost of $200,000 ($4.2 million in 2009 dollars). The new hotel originally touted a frontage of 150 feet by 130 feet long. The four story high building is constructed of pressed brick, with white enamel ornamental trimmings. 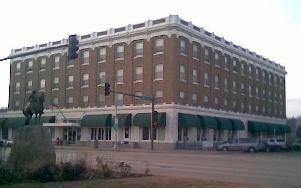 Mr. Hanna initially leased the hotel to Keller & Boyd, who also operated the Waldorf Hotel in Fargo at the time. 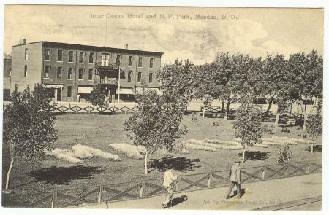 Newspaper accounts touted the new structure as "The Pride of Mandan" and authors credited it "architecturally as one of the most beautiful hotels in the Northwest." It was added to the National Register of Historic Places in 1983. The building was designed by William J. Gage who was born in New York City and studied architecture at the University of Illinois. He began his career with the firm of Long, Lamoreaux and Long of Minneapolis in 1911 but joined Ellerbe and Round of St. Paul from 1912-1913. After moving to Fargo in 1913, Gage drafted for Haxby and Gillespie until 1915 when he and his partner Archie Ashelman began their firm there. Around 1919, Gage moved to Seattle and eventually to California in 1921. Another featured work, the Beverly Hills, CA City Hall also remains in active use today. In January 1930, a fire consumed the rear of the structure. Fargo architect W. E. Kurke coordinated the repair and expansion of that part of the building to three stories featuring 10 apartments and 10 additional hotel rooms in 1935. The cost of the project was $18,000 ($230,000 in 2009 dollars). In its earliest days, the building tenants included the Merchants National Bank. Today, several business offices reside on the ground floor of the building. The former Billards Room is now home to a community church. In July 1985, Ben and Dan Hanna sold the building to Lewis and Clark Investments, Inc. whose major stockholders include William Clairmont of Bismarck and Wallace Joersz and Dan Hanna of Mandan. Leveraging a $975,000 MIDA bond finance package, the 67 hotel rooms were converted to 45 one- and two-bedroom rent subsidied apartments. The lobby was later remodeled and the back meeting rooms with sky lights once again made available for public use.